Studying the response of living organisms to climate change is essential in the face of what increasingly looks like an irreversible trend. However, unlike other species which have gathered much scientific attention, insects seem to have been left behind. An EU project is seeking to bridge this knowledge gap while taking insects' specific features into account. The CLIMINSECTS (The effect of expected climate change on insect performance: physiology, behaviour and life history) project was born from the observation that insects show very flexible responses to climate change. Unlike mammals or birds, insects can see their performance being affected even by the most sudden and short term changes in temperature, also known as variance of climate traits. This means that the annual or monthly changes other studies commonly refer to are mostly irrelevant in the case of insects. 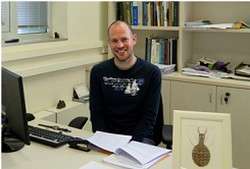 Dr Inon Scharf, who coordinates the project at Tel Aviv University, discusses early results of his study of flour beetles, insects collected by the university over the past 100 years, and additional insect predator species, already investigated in the lab under other projects. Why is it so important to know more about the effects of environmental variance on insects? Variance is highly important for different reasons. First, global warming is expressed not only as an increase in the annual average temperature, but also an increase in the frequency of extreme events, such as heat waves. It is therefore important to study how a sudden change in temperature, even for a limited time period, affects insect performance. Second, insects experience daily changes in temperature, sometimes over a very short time, so annual or even monthly temperatures, which are usually referred to in such studies, may be of lower relevance. Third, insects have a shorter lifespan than most vertebrates, and therefore even relatively short extreme events may have significant consequences for the insect's performance and response. Variance of the response traits are also important. Ecologists were long interested mainly in average responses to different factors, and treated variance in response variables as 'noise'. However, this variance is very important when seeking to understand the potential for evolutionary change. When individuals are tested several times, it is not trivial whether and to which extent individuals are repeatable in their response (for instance, always responding better or worse than average), whether females and males have similar responses, and how age and stressors experienced by groups of individuals induce such variance. What were the main types of effects you investigated and why? We asked ourselves three questions: How is the ability of insects to tolerate unfavourable warm or cold temperatures affected by other stress sources, such as starvation and old age? How does exposure to different temperatures as larvae and as adults affects insects' tolerance to extreme cold and heat shock, survival under starvation and reproduction, and how does repeated thermal stress affect insect performance? Does the body size of insects decrease as a possible response to ongoing global warming? Answering the first question is important because insects live in complex environments and have to simultaneously cope with multiple stress sources. Studying how well they cope with thermal stress is important for better understanding the range of responses to unfavourable climate conditions, which also depends on other environmental aspects. This is also important for understanding how animals trade off between different demands. The second question arose as thermal exposure during different life stages can lead to different outcomes. Whilst mild exposure to unfavourable temperatures during the adult stage often leads to beneficial acclimation to harsher temperatures, exposure to unfavourable temperatures during the growth stage is less likely to have a beneficial effect. This question is important not only in the context of climate change but also to understand whether some life stages are more critical than others. Regarding the third question, many researchers currently believe that body size decreases in response to global warming, while others doubt that the response is general and universal. While this decrease has been studied in mammals and birds, almost nothing is known for insects, in spite of the fact that most of earth biomass and number of species are insects. How did you proceed to answer these questions? First, we established a system of flour beetles in the laboratory. These are common pests found in meal storage areas, mostly in the developing world, which are easy to grow and keep in the lab. Their short generation time allows relatively fast adaptation and response to environmental change and they are ectotherms: they are affected by climate more than endotherms, which regulate their body temperature. We raised the beetles under different thermal conditions, testing various behavioural, physiological and life-history responses, keeping them until old age, starving them and inducing repeated thermal stresses. The point was to study the effect of all of the above on thermal tolerance and other traits related to ecophysiogical performance, such as activity, mating behaviour, reproduction and survival. In addition to these lab experiments, we also gained access to the large insect collection of Tel Aviv University (a part of The Steinhardt Museum of Natural History), with a few million specimens collected over the past 100 years or so. This collection allowed us to study possible body size decrease in response to climate change. Finally, we shifted ongoing projects in the laboratory, mainly on insect predators that use traps for hunting, such as pit-building antlions and wormlions, to include aspects of thermal ecology. We notably compared the behaviour (cannibalistic behaviour, for example) of insects originating from different climatic regions in Israel. We became interested in how climate generally affects behaviour. What would you say are the most notable results of the research so far? We could observe that the thermal tolerance of insects deteriorates with advanced age and starvation. The effect of starvation is nevertheless reversible. Then, we noticed that growth and adult temperatures have a different and sometimes contrasting effect on thermal tolerance. A third finding is that repeated thermal stress in the laboratory leads insects to enter a sort of 'energy-saving', resilient mode, with lower activity and reproduction, but better tolerance for further stress. There is a carry-over effect to the offspring of parents exposed to repeated stress, and their offspring are somewhat smaller. Finally, our analysis of specimens collected over 100 years, in contrast to mammals and birds, shows that body size probably does not decrease in response to ongoing climate change. We failed to show a decrease in body size in beetles, and concluded that this 'rule', even if valid for mammals/birds, does not hold true for beetles and plausibly for other insects as well. It could be that insect phenotypic plasticity—meaning the ability to express different phenotypes by the same genotype and the contribution of the immediate environmental conditions—is too strong and fully mitigates potential effects of climate change. Based on this project, how do you think insects will evolve in the face of climate change and what could be the consequences? Hard to say. We mainly focused on immediate phenotypic responses to climate change. I think that our work mainly demonstrates how plastic insects are when coping with changes, and how short-term conditions can have significant and diverse effects. My guess is that insects are tougher than it seems, and due to their strong plasticity) they will survive quite well. Other researchers even expect an increase in insect performance, because plants will be more stressed and produce less biochemical compounds to protect against insects that eat them. This may have worrying implications for pests and agriculture. Generally speaking and without a direct link to our research, the effect of climate change on insects may be important concerning phenology, meaning the time link between plant flowering and their insect pollinators, with negative effects on both, and distribution ranges of different species. Needless to say, the ones most threatened are those with limited distribution range, those with poor dispersal ability, or those inhabiting very cold areas: they have nowhere to escape, while those in warm areas could migrate to places previously being too cold for them. Interestingly, insects grow faster under warmer conditions, and increasing temperatures will enable insects to invade habitats currently not populated by them.